The Options tab provides access to several options that affect how the Google Analytics data is presented in Excel. Rates/Percents: By default, Analytics Edge will convert rate and percentage metrics into fractions of 1 (50% = 0.5) so that the cells can be formatted using Excel’s % formatting. If you would rather see 50 in the cell, select Number. Dates: Analytics Edge automatically converts dates into Excel dates. If you would rather get the non-standard response (20140725) format, select String/Number. Numeric Dimensions: By default, all dimensions are delivered to Excel in text-formatted cells. Some dimensions, like Count of Sessions are numeric in nature. If you would like to see these “numeric” dimensions presented as numbers, select Number. Time Metrics: by default, time metrics like Time on Page and Sessions Duration are expressed in seconds. Select Days to make it possible to format the cell in Excel using a Time format to get hh:mm:ss formatted times. If your query is subject to data sampling, you can choose to be warned of this happening by checking the box ‘warn if results contain sampled data‘. 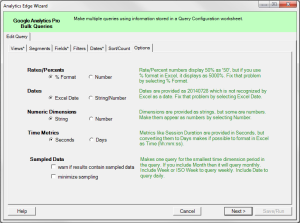 You can minimize sampling errors by reducing the time-span of the query, or include a time dimension and check the box to ‘minimize sampling‘. Doing this will cause Analytics Edge to make queries for the smallest time dimension in your query. 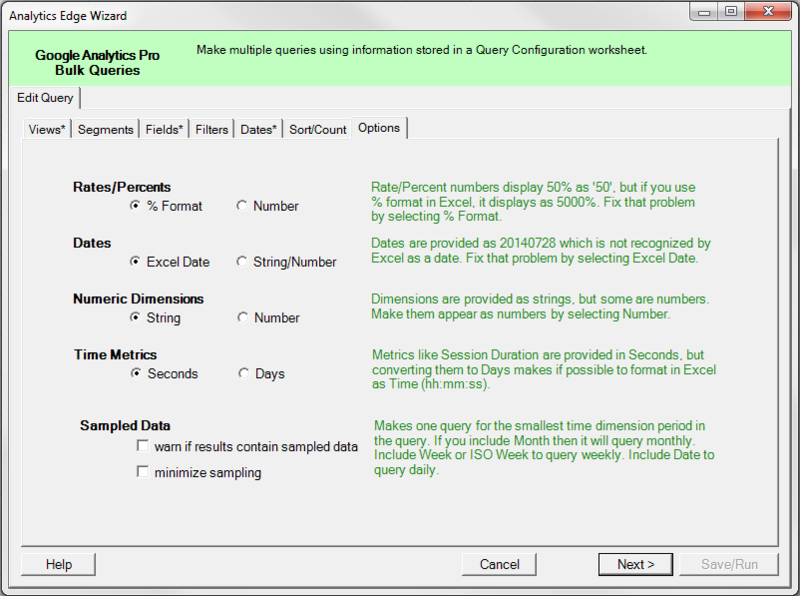 If you include Date ( or Day Index, or Day of Month) then it will query for each day. Similarly for any Week, ISO Week, Month or Year dimension. If you include more than one time dimension, the smallest one will determine the query resolution. Note that there is no restriction or special handling required with other dimensions or metrics in your query. Be aware that there is a daily limit of 10,000 requests per View.